Transitional Deacon James Brockmeier loves movies, especially coming-of-age films where the young main character is initially pictured as shy and uncertain before embracing a moment that reveals his growth and conviction. At 26, Deacon Brockmeier had one of those moments in his own life at the National Catholic Youth Conference in Indianapolis in November of 2015. He had been chosen to proclaim the Gospel and serve at the conference’s closing Mass in Lucas Oil Stadium, sharing the word of God with 26,000 people from around the country and the world, including a cardinal, 18 bishops and 250 priests. Before the Mass, the thought of speaking at “the biggest experience of being at Church” he’s ever had was nerve-racking and intimidating for him. But when the moment arrived, he found an inner calm—even with a large camera boom close to his face, projecting his image onto big screens inside the stadium. As he looked out on the youths and remembered being at the same conference when he was 14, he had one prayer for them. On June 25, Deacon Brockmeier will celebrate his place in the Church when he is ordained a priest for the archdiocese. His ordination will come five years after a major turning point in his life—a night during his senior year in college when he returned from a date. “Really juicy stuff here,” he says with an easy laugh as he prepares to share the details of that evening. As he drove home after saying good night to his date, he suddenly saw the two most likely roads for his future. One was to follow the plan that brought him to Marian University in Indianapolis—to become a high school religion teacher or youth minister, and to keep open the possibility of marriage and family someday. The other road led to the priesthood. It was a consideration he first had when he was 15 and he heard a talk by a vocations director. That consideration resurfaced just weeks earlier when he talked with a friend who had graduated from Marian the previous year: Ben Syberg, now an archdiocesan priest. “At the time, he was a first-year seminarian at Saint Meinrad [Seminary and School of Theology],” Deacon Brockmeier recalls. “He said he loved Saint Meinrad, and I should think about the seminary. It stuck in my mind. One of Deacon Brockmeier’s favorite movies offers an insight into him as a person—and a perspective on his journey to the priesthood. I Am David is the story of a 12-year-old boy who has lived his entire life in a Communist, forced-labor camp in Bulgaria. In 1952, a prison guard helps him escape and directs him to begin a journey to Denmark that unexpectedly leads the boy to a reunion with family. While Deacon Brockmeier says there “are obviously no parallels in the story to my life,” the themes of the movie resonate with him. 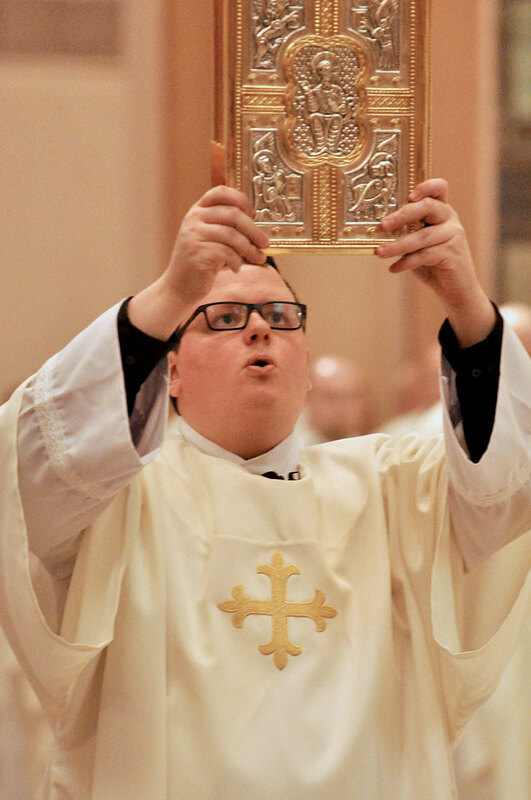 “I have been reflecting about how many people have walked with me on my journey to the priesthood,” says Deacon Brockmeier, whose life as a seminarian has led him to serve in the parishes of Holy Family in New Albany, St. Boniface in Fulda, St. Meinrad in St. Meinrad and the parish that he considers home, St. Mark the Evangelist in Indianapolis. His gifts as a priest will be numerous, says Bob Kattau, a member of St. Mark Parish who has seen Deacon Brockmeier come of age in the past five years. Kattau especially recalls the impact Deacon Brockmeier made when a bus of St. Mark parishioners visited Saint Meinrad Seminary. So do his parents, who live in the Covington Diocese in northern Kentucky, where Deacon Brockmeier grew up and attended Covington Latin School as a teenager. “He has an ability to empathize with others,” says his mother Norma. “He feels others’ pain, and he responds to that in a loving way. He was always there for his friends in high school and college, and he helped them with their faith. Future parishioners can also expect two other qualities when he becomes their priest, says Katie Hibner, a friend from their days at Marian University. Deacon Brockmeier offers his own vision of his priesthood and the Church. It flows from a memorable scene during a pilgrimage he made as a seminarian to England, France, Italy and Switzerland. The scene unfolded as he entered Sainte-Chapelle (“Holy Chapel”) in Paris. Deacon Brockmeier was soon drawn by one of the stunning features of the chapel: the 15 stained-glass windows—each measuring about 50 feet high—that depict 1,113 scenes from the Bible. “Each of these stained-glass windows was handmade,” he says. “The theology of the space is that the light of Christ reaches us in the Scriptures. We sit in the midst of the word of God, and God’s light shines through these stories. Deacon Brockmeier can’t wait to follow that call as a priest. He has built a foundation for his future by helping with parish youth groups, providing campus ministry at a college, and visiting people in hospitals and nursing homes. Hobbies: Fishing, golfing, watching movies.